Before you freak out, this new feature didn’t launch with opt-in checked by default. Unlike some prior facelifts, Facebook finally did something right. Rest assured, your weekend whereabouts haven’t been on public display for days. Oh, and like Facebook Paper, this update is for US only. Canadians will just have to keep guessing where their friends are. So what’s the point of this new feature? Facebook’s mantra has always been to help you “connect with friends and the world around you.” For the most part, this only happens online, and can lead to anti-social behavior or even depression. Nearby Friends wants to to help us connect more offline, in person. You know, those random times you just “bump into a friend” while out & about? You feel so much joy from seeing each other that drop everything and go have coffee! Or maybe if you knew the friend you were texting with was only 2 blocks away, you’d just opt to meet up in person and talk. Face to face. Like “normal” people. Location based apps have been gaining fame for a while now though. How cool is it my Starbucks card pops up in Passbook when I approach my usual store? Apps like Tinder, which “help people meet,” made headlines during the Sochi Olympics for its popularity among the athletes et al. Being tracked does have its benefits. On Facebook though, I’m not so sure. What makes Nearby Friends special is that it only shows that you have friends nearby, not exactly where each of them is. A friend would have to purposely share their precise location—and for a set amount of time—for you to see it. 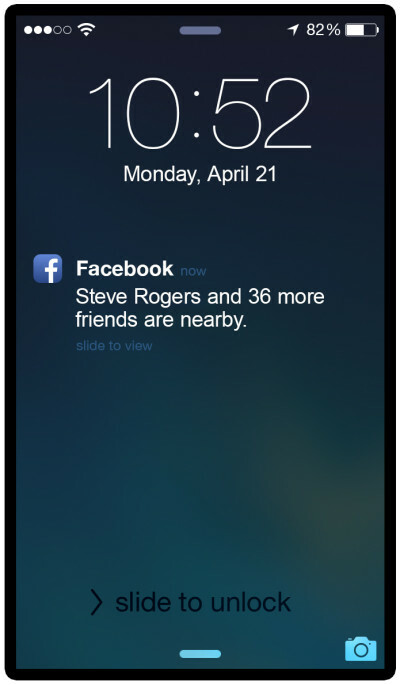 Unless set forever, the sharing goes back to “nearby mode” on its own after a day. Thank gawd. That’s a step up from Apple’s “Find My Friends” app, which allows paired friends to see each other’s exact location at all times (unless turned off). Alerts can be set up, so whenever your friend left home, arrived somewhere, etc., you’d know. Unless you’re a strict parent keeping an eye on your kid, does that sound creepy? Yes. Yes it does. Very creepy! On a final note, while Facebook tracks your whereabouts to show your friends, it also stores the data so it can target more ads at you (shock!). It’ll know your daily commute, where you shop, places you hang out, etc. Now you know the real reason for this feature! So you still want to be tracked? It’s up to you. If you think letting your friends know where you are 24/7 will lead to more coffee meet-ups, then go for it. Opt-in! Just know what you’re getting in to.